Haredi MKs back Netanyahu as PM, as vote count update shows United Torah Judaism netting 8th seat – at the expense of Likud’s 36th seat. The provisional results for last Tuesday’s Knesset election now show the Likud with 35 seats, down one from the initial results released last week by the Central Elections Committee, while the haredi United Torah Judaism party gained a seat, rising from seven to eight mandates. While the final results will not be ready until Wednesday, the latest vote count update released by the Central Elections Committee shows the United Torah Judaism faction with eight mandates, at the Likud’s expense. The actual shift in votes was minor, however, and leaves the UTJ’s eight seat with only an 80-vote margin for the time being. The seat could thus be ‘lost’ by another minor shift in the vote total. The Likud remains the closest party to another seat, requiring just 202 more votes – if the remaining vote count remains unchanged – to regain its 36th seat. If the UTJ gains additional votes, however, the Likud will also require more additional votes beyond the 202 it currently lacks, at a rate of 2.5 votes for every additional vote counted to the UTJ. Because the seat change on Monday occurred between the Likud and UTJ, the balance of power between the right and left blocs remains unchanged, with 65 seats for the right-wing – religious bloc, and 55 seats for the left-wing – Arab bloc. On Monday, United Torah Judaism representatives met with President Rivlin for consultations prior to the president’s selection of a candidate for the premiership. UTJ recommended Netanyahu be tapped for a fifth term as prime minister. 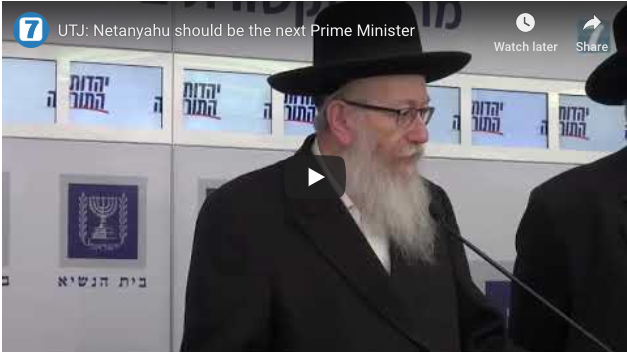 “We recommend Netanyahu as candidate for the premiership,” said Deputy Health Minister Yaakov Litzman.